St Martin’s: a community of prayer and welcome in the name of Jesus Christ since before 597AD. The oldest church in continuous use in the English-speaking world. Part Roman, part Saxon. St. Martin's Church is the oldest Church in in the English speaking world still used for worship. It was here that St. Augustine set up his mission when he arrived from Rome in 597 AD to convert the English. 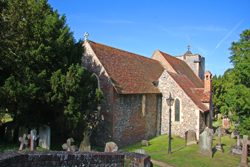 For this reason it is sometimes called the first church of the Anglican Communion, and forms part of the Canterbury World Heritage Site - the other two parts are Canterbury Cathedral and St Augustine's Abbey. There is a said Parish Eucharist every Sunday at 9.00am (Prayer Book sung service on the first Sunday). Tuesdays, Thursdays and Fridays 11am to 3pm. Visits on other days may be arranged after prior notice by sending an email to visits@martinpaul.org.